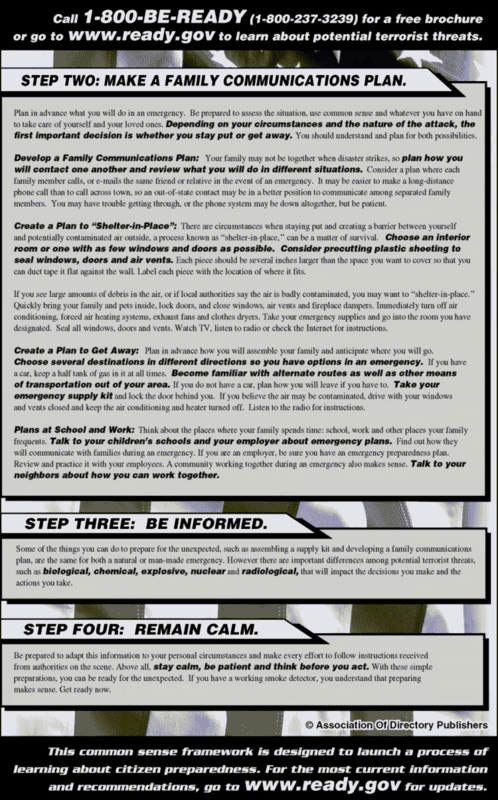 The READY Campaign is an emergency preparedness information effort sponsored by the Department of Homeland Security (DHS), The AD Council, and the Alfred P. Sloan Foundation. The objective of the READY Campaign is to inform all Americans of the issues and procedures recommended by DHS to enable them and their families to be as ready as possible to respond to an act of terrorism against our nation. The READY Campaign has selected telephone directory publishers across the country to be an integral part of the communications network assisting in the dissemination of this potentially life-saving information. The Association of Directory Publishers (ADP) is please to provide the information approved by DHS to its Publishers Members and others via this site. ADP invites and urges its membership to support The Ready campaign through their full participation. Details of that voluntary support follow. COMMITMENT: The Department of Homeland Security asks each participating directory publisher to contribute two full pages in each of its directories for a minimum of one full year directory cycle for all titles. POSITIONING: Placement is at the discretion of each participating publisher. Three positions are recommended for each publisher's consideration. One is pages 2 and 3 at the front of the book, which in many directories follows the local emergency information found on page 1. 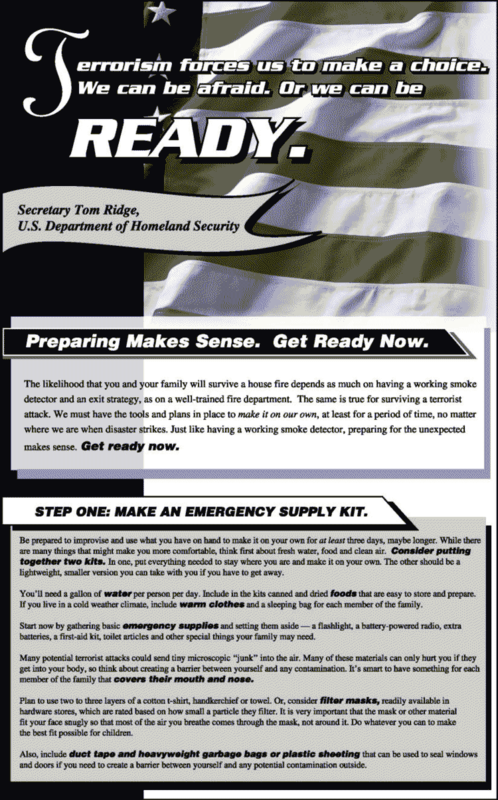 Another is under the newly-established heading "EMERGENCY PREPAREDNESS", where not only may The READY Campaign pages be placed, but also general advertising products and services supporting DHS' recommendations for preparedness as well as others for daily household safety. The third, properly referenced, would be in the Government section of a directory. Published By The Environmental Yellow Pages, Inc. Copyright © 1995 - 2019 The Environmental Yellow Pages, Inc.